A lawsuit filed by a group of Gorham neighbors seeking to move a controversial OHRV trailhead away from their homes will go ahead in Coos County Superior Court, according to a ruling last week by Judge Lawrence A. MacLeod. Although some claims have been dismissed, MacLeod ruled that the nuisance claim against Gorham can move forward along with the inverse condemnation claim against the state and town. Inverse condemnation is the taking of someone’s property without compensation. “The Court recognized that a claim for OHRV nuisance exists and the town and state may owe damages for loss of property value caused by the nuisance,” said attorney Arthur Cunningham who filed the lawsuit. MacLeod denied the motion to immediately close or move the trailhead, which gives riders access to the state’s popular 1,000-mile Ride The Wild trails system. He ruled that the state has sovereign immunity and said that town zoning enforcement is discretionary. Cunningham, who represents the 13-member group that owns seven properties on Crestwood Drive and Route 2 in Gorham, said it is important that the judge recognized the nuisance claim. “Remember, my clients asked only that the trailhead be removed from their neighborhood,” Cunningham said. The trail and lawsuit have pitted neighbor against neighbor and business against business in Gorham, especially when a group of local businesses filed as intervenors to oppose the lawsuit. Ray Bergeron, who runs White Mountain ATV Rental, supports the idea of Gorham as an off-road destination. After so much bad economic news over the years, Bergeron said the trail is an important boost to the community. “This is our new economy. We are very fortunate to have forward-thinking people in the community,” Bergeron previously told InDepthNH.org. However, Howie Wemyss, general manager of the Mt. Washington Auto Road, quit the Androscoggin Valley Chamber of Commerce after it joined the group of business intervenors. On busy weeks during the summer, the trail system saw as many as 4,000 ATVs using the trail, with an average daily use of 290 ATVs during July and August 2016, MacLeod’s order stated. Between 2015 and 2017, Gorham police logged 500 complaints related to the use of the trail and conducted 270 stops of OHRV trail users, he wrote. The facts allege that the town’s 2011 decision (to allow the trail) led to the creation of a nuisance in the plaintiffs’ neighborhood from OHRV users that is continuing, MacLeod wrote. “At this time, assuming the plaintiffs’ factual allegations are true and construing all reasonable inferences in their favor, this is sufficient to state a claim for nuisance against the town,” MacLeod wrote. And since it is ongoing, MacLeod dismissed the town’s claim that it was barred by the statute of limitations. MacLeod recounted testimony from the hearing in June. Gorham is a town located in the White Mountains with about 2,848 people. The homeowners in Gorham who are suing are Lois and Harry Stearns, Nancy and Bruce Neil, Mark and Heather Malia, Audrey and Rene Albert, Priscilla and Albert Bergeron, Sandra Lemire, Diane Holmes and Michael Pelchat. 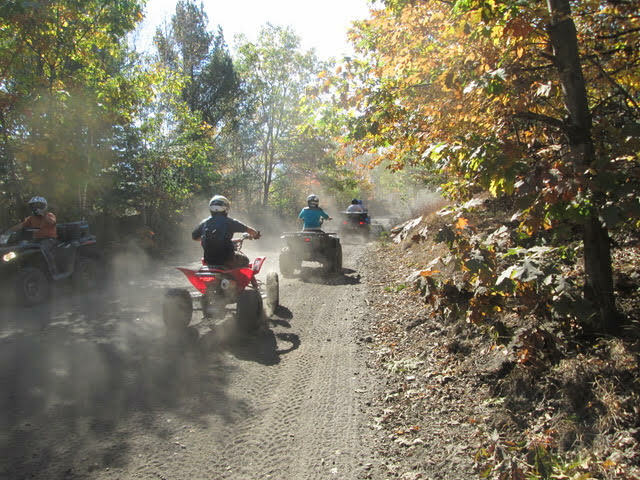 The state operates a trail system on public highways, abandoned rail beds and on private property that is utilized by off-highway recreational vehicles, a portion of which is located in Gorham. The suit is filed against the town of Gorham and the commissioners of the Department of Transportation, Department of Natural and Cultural Resources, and the Department of Resources and Economic Development. A court structuring conference has been scheduled for December.